What gadgets would sit under your Christmas tree this year, compared to 10, 20 and 30 years ago? Christmas is the perfect time for looking back and reflections. Traditions are the hallmark of the festive season, but it is by noticing the subtle changes in seemingly fixed ritual, we can spot how our lives and our society slowly evolves. Imagine then, what gadgets would sit under your Christmas tree this year, compared to 10, 20 and 30 years ago? So we thought it'd be fun to look back at what tech you might have been unwrapping in days gone by. 1975 was the stone age of computing - and looking back it might have been the year that humans finally figured out that by sanding down the edges of a rock, it might make it roll more smoothly. This was the year that the Altair 8800 was first sold in the US. Sure, you've never heard of it - but you know the company that built the computer's BASIC interpreter, which enabled home users to code their own software: Bill Gates and Paul Allen developed the software and formed Microsoft in 1975. 1975 also signalled the starting of the now legendary home recording war between VHS and Betamax. The two formats spent the late 70s and early 80s battling for dominance just as Blu-Ray and HD DVD did a generation later - and this year saw the introduction of the first Betamax players. So if you were seriously ahead of the curve, you might have been able to tape the 1977 Morcambe and Wise Christmas Special, which to this day remains one of the highest rated TV shows in British history. And what's most amazing? It was only in 1975 that BIC released the first disposable razor. So there's a chance that people could have had home computers before they could have shaved reliably in the morning. Fast forward ten years to 1985 and technology starts to appear much more recognisable. Music was perhaps one of the technologies changing fastest. By now the Sony Walkman dominated music and made it portable for the first time, and the first CD players were starting to hit the shops. Amazingly the first portable Sony Discman was released in late 1984 - so a D-50 player might well have been on Christmas lists in 1985. In computing, 1985 was a mixed year, though the original Macintosh (first released in 1984) remained popular, and the first Commodore Amiga hit the shelves (though it wouldn't achieve the same popularity as the Commodore 64 which it was designed to replace). The ZX Spectrum also remained popular. Most notable in retrospect was Microsoft's release of Windows 1.0 which ran on top of DOS and brought to PC many now-standard features including well, windows and multitasking. Gaming wise most important was the release of the first Nintendo home console - the Nintendo Entertainment System (NES) quickly became popular with lightgun title Duck Hunt an early stand out title on the system. In video, if your VHS player was already old-hat, you might have been tempted to ask Santa for a brand new Laserdisc system, the first of which went on sale this year. The format wasn't hugely successful - though the picture quality won it many fans amongst AV nerds. Christmas 1995 would have been an exciting time for any gadget and technology enthusiast, not least because there was a new way of buying your presents this year: an online auction website called eBay launched this year. 95 was a big year for gaming, with the release of the original Sony PlayStation alongside the troubled Sega Saturn. Though the Saturn was scheduled for release in September of the year, the company shocked the world by announcing at E3 (in May) that the Saturn would be available immediately from select retailers. It turns out it wasn't a wise move though, as the resulting console wasn't finessed and perhaps more crucially, Sega managed to upset all of the retailers who won't part of the early release in the process. Other big game releases of the year came in the form of Super Mario World 2: Yoshi's Island for the Super Nintendo as it entered its twilight years, as well as the first Worms game on the Amiga. Handhelds were big news too. 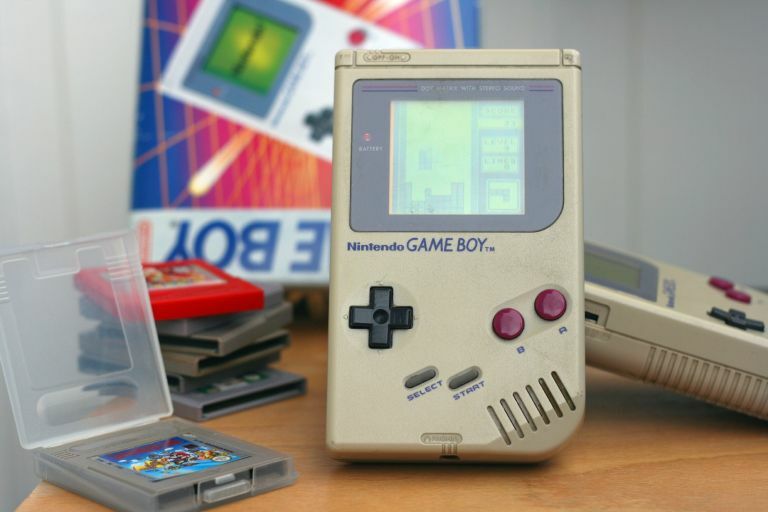 Amazingly, six years after the handheld's original launch Nintendo refreshed the original Game Boy - keeping hardware and design identical, but made it available in coloured cases. (Hardware which would remain the same until the Game Boy Advance in 2001 - imagine using an eleven year old machine today). Though perhaps the biggest handheld news… or should we say “faceheld” was the release and subsequent abandonment of the Nintendo Virtual Boy. An early attempt at a VR headset, it was supposed to make games more immersive but just ended up giving the wearer a headache. If you got one of these for Christmas, you would have run out of gams pretty quick too as there were only ever 19 games released for the system - five of which didn't even make it to America. In computing, the big release of the year was Windows 95 - so the upgrade CD (or thirteen floppy discs) could have been a big gift for nerds of the time. And if you wanted for storage back then, perhaps the best method was to ask Santa for a ZipDrive from Iomega. These 100mb (gasp!) capacity discs were released at the end of 1994 but remained popular amongst certain types of PC user for some time as they bridged the gap between floppies and rewritable CDs. Interestingly, they're apparently still used today for certain niche interests, such as for transferring data to old computers because Zip drives were built that can work both via USB or through the old SCSI standard found on old machines. 2005 might feel as though it was just last week, but in technology terms it was a lifetime ago. If you wanted a top mobile phone for Christmas, you would be unwrapping a Sony Ericsson K750. This was a 2G GPRS “featurephone” that had a screen running at 176x220 (this year's Sony Xperia Z5 Premium has a 4K display running at 3840x2160), and just 38mb of internal memory. Don't worry, if the 2MP camera was eating up your memory you could always expand it with a Sony MemoryStick card up to 2 whole gigabytes. And while it came years before the app store, it could run early versions of apps. Nicknamed “Midlets” and built using Java, these apps had to be downloaded on a computer and copied across. And even if you could find a use for them, it wouldn't have mattered much anyway as you would have maxed out your paltry data allowance in no time. Meanwhile, the iPhone was still two years away and Apple's top technology was the 5th generation iPod Classic, which for the first time could play videos on its tiny screen. It had 30GB of storage on a tiny hard disc rather than SSD. The first generation iPod Nano was released this year too - coming in storage capacities of 1GB, 2GB or even a massive 4GB. It was also a year when we could finally start putting away the zip discs, as USB flash drives arguably earned mainstream usage - not least because many MP3 players around this time essentially acted exactly like flash drives with a music player bolted on. In the world of gaming, Sony released the PlayStation Portable (or PSP) that year and though moderately successful, the platform's new “Universal Media Disc” storage was a bit of a dud. In addition to games, Sony tried to make UMD a new video format too. So if you received Spider-Man 2 on UMD for Christmas that year, hoping that you might also soon be able to insert your “Universal” disc into anything else then… well, bad luck. The PSP did come into its own in its later years though as a popular platform for homebrew and emulation, so if you got one, it might not have been all bad. 2005 arguably heralded the mainstream start of 64-bit computing, with the release of the 64-bit version of Windows XP that year. Essentially overnight, this doubled the speeds computers could run at, as now you could make use of the full 64 bit processor on your motherboard. And finally, if the film itself didn't put you off, 2005 was also the year of Revenge of the Sith - so chances are you might have got some Star Wars merch too. Maybe this Darth Vader voice changer? And finally we reach 2015 where the big gadgets of this year suddenly seem so much more futuristic. The iPad Air 2 and iPhone 6S are the must-have gadgets from Apple - and these both lead a huge product category that didn't even exist a decade ago. In gaming, the PS4 and Xbox One are still leading the pack as they enter their third Christmas on the shelves. This is usually the point in a console life cycle when we start seeing the titles that make a console's reputation, as developers have got to grips with the hardware. Whether we've seen that this year though, is for you to decide. And if you want a more exotic gift this year, then consumer drones are now a thing. Back in 2005 even the Pentagon was reticent to admit that it had drones, such was the high-tech technology - but now you can literally buy them off the shelf (albeit sans missiles). And if one thing has endured from previous decades it is this: That once again, you can buy tenuously linked Star Wars gadgets, with this year's Force Awakens promising more cash-ins than ever. Perhaps the biggest this year is EA's online shooter Star Wars Battlefront, which when given some specific mods, can be made to look almost as good as real life.